A Slump is similar to a Cobbler or a Grunt. They are a dessert made with different kinds of fruit covered with dough and baked in the oven. The only difference is that this slump is served inverted on a serving platter similar to a pandowdy. This Fresh Peach Slump is the perfect dessert to serve on a cool evening. Preheat the oven to 400F. Lightly butter an 1-1/2 quart baking dish. Combine the peaches, brown sugar and the almond extract. Spread in the bottom of dish. In a medium bowl, stir together flour, baking powder, and sugar with wire whisk. Cut the butter into the flour mixture in a food processor, with a pastry blender or two forks until it forms coarse crumbs. In a small bowl, combine the milk, buttermilk and egg. Add to flour mixture. Do not knead; the dough will be sticky, stiff, and lumpy. Drop by the spoonful over the peaches. Bake the peach slump for 25 minutes or until the top is golden and the juices are bubbling. Cool on a wire rack for about 5 minutes. Loosen the biscuit from the sides of the pan and then invert it onto a serving platter. This Peach Slump is best served warm topped with a dollop of homemade whipped cream. This pound cake is rich and full of good things like butter and eggs. Of course, you can't forget the peaches. 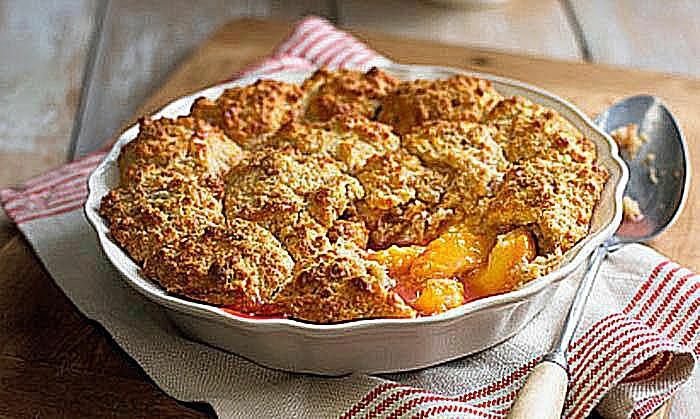 What makes this cobbler easy is the use of a cake mix instead of the typical biscuit ingredients. The topping in a crisp is made with flour and old fashioned oats. Of course, you can't forget the spices too. Fritters are a fried doughnut filled with chopped peaches. They taste great with a cup of coffee.